On Saturday, April 13, Witt students enjoyed the annual Wittfest festivities. It was a day filled with food trucks, giant pong and a mechanical surfboard, as well as performances by Shanté Leslie, ‘22, and Deryn Tye, ‘20, Molly Moran, ‘22, Pocket Lint, Just Eve, Maia Grandy, ‘20, Dance Company and Wittmen Crew. 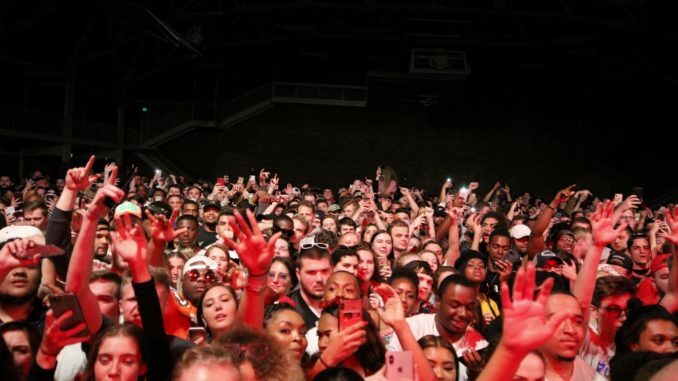 When it hit 7 p.m., students enjoyed concerts in the 1929 fieldhouse by rising country artist Conor Clemmons and popular rapper Waka Flocka Flame. Both artists fed off the energy of the crowd and delivered performances that students loved. Clemmons is originally from Charlotte, N.C. He dropped his debut album “Left of Center” in 2016 and has been spending his time recording music in a Nashville studio. He is most known for his hit song “What If I Fall,” which featured Erin Sparks and topped out at 14 on the iTunes Country list. After an introduction by Union Board (UB) member Casey Luther, ’20, Clemmons’ band began and Clemmons jumped on stage in front of about 60 students. Wearing a white t-shirt and a leather jacket to perform. Clemmons opened with the song “Damn Good Night” by Drew Jacobs. From the get go, Clemmons was energetic and lively; he danced and swayed across the stage as students waved their hands and clapped along with the beat. Clemmons then sang “Gotta Get Me Some of That” by Thomas Rhett. Students danced and sang along with the popular song. Afterwards, he began to sing “Burning Man” by Dierks Bentley. Clemmons then played one of his own songs, “Close to Country,” which is currently listed as his third most popular song on Spotify. The band then broke into “Black Betty” by Ram Jam, showing off their. Specifically, the main guitarist, Charlie, displayed his skill on the electric guitar with a dazzling performance. Later in the show, Witt students got a treat as Clemmons played his new summer single. The song, “Sober,” has yet to be released and Clemmons plans to debut it in Nashville this summer. He described the song as being about the struggle of continuously doing something you know you should refrain from. The song was passionate and lively as Clemmons danced around the stage. Clemmons closed his performance with a series of covers: “Dip” by Devin Dawson, “Meant to Be” by Bebe Rexha and featuring Florida Georgia Line and “Sorry Not Sorry” by Demi Lovato. He thanked the crowd one more time and exited the stage. As Clemmons performed the crowd in the gym had begun to grow in anticipation of Waka Flocka’s performance. Between performances, a paintless rave took place. Students were given the opportunity to dance and sing along to a mix of throwback and current songs. A few of the songs that were remixed: “Gold Digger” by Kanye West, “Wobble” by V.I.C. and “Hollaback Girl” by Gwen Stefani. As time rolled around for the main event, students moved into the fieldhouse. Streams of students pushed their way to the front to try to be directly in front of the stage. By the time the rave had ended, two thirds of the fieldhouse was full, still allowing for some students to stand in the back outside of the chaos. As the rave crew exited the stage, the D.J. for Waka Flocka hopped up and began playing music. With deep bass that echoed through your torso, the music set the tone for the rest of the evening. The D.J. got started by having students wave their arms in the air and chant for Waka Flocka. Waka finally came on stage. After much anticipation, and the entire ambiance of the fieldhouse changed. Students jumped up and down and climbed on each other’s shoulders. The fieldhouse quickly warmed up as everyone was packed closely to the stage. Waka Flocka danced and jumped around, sending his dreads flying. When he paused from singing, he would grab a water bottle off the stage, open it and throw it out into the stage, sending an explosion of water into the air in the meantime. The crowd went wild later in the concert as Waka Flocka left the stage and appeared in the crowd. He did this multiple times, which allowed for student interaction. Students were given the opportunity to view the artist up close, take pictures with him and dance along with him. “Seeing Waka Flocka in the crowd about five feet from me was awesome and suprising because I didn’t realize how big [tall and muscularly built] he actually is,” Greyden Yoder, ’20, said. Waka was a crowd-pleaser as everyone was dancing around and students exited the building with smiles. “Best Wittfest of my two years here,” Courtney Swihart, ’21, said. Anna Shouvlin, ’20, promotion chair of Union Board member was also pleased with Waka Flocka’s performance. Wittfest was a definite success this year and hopefully UB will top itself next year.